Home » Safaris » 3 Day gorilla tour in Congo. 3 Day gorilla tour in Congo will introduce you to information about the Mountain gorillas, teaching you that the Gorillas share 98% of our DNA and as such are very susceptible to catching human infections, particularly respiratory ones, but they don’t have our immune system to deal with them – a common cold could eventually prove life-threatening. Various rules for gorilla trekking are therefore in place to help protect these precious primates. Only one group of tourists can visit the mountain gorillas each day and once you’ve found them, you’ll have just one precious hour in their company. If you have a cold, flu or other contagious infection, you shouldn’t go gorilla trekking. 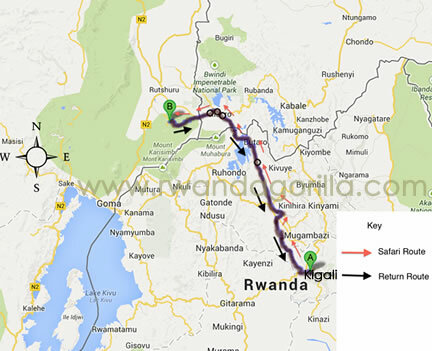 Day 1: 3 Day gorilla tour in Congo: Transfer to Kisoro-Uganda from Kigali. In the morning, you will have a Kigali city tour, and after lunch, transfer to Kisoro-Uganda, on the border town with DR Congo and Rwanda, on the foot hill of Mt.Muhavura. Dinner and overnight at Travelers rest house/ Kisoro tourist hotel. Day 2: 3 Day gorilla tour in Congo : Gorilla tracking. Early morning, you will cross over to DR Congo and head to Virunga national park for the memorable adventure with the gorillas. This will be preceded by briefing from the authorities of the park, before setting off for the trekking into the rain tropical forest searching for the habituated gorilla family. You will remain close to the beautiful primates for a maximum of one hour, make observation and photography. Make sure you carry with you packed lunch and water. After tracking cross back to Kisoro-Uganda for dinner and overnight at your hotel. Day 3: Transfer back to Kigali. After a relaxed breakfast drive back a scenic journey to Kigali, reaching by lunch time. In case your departure flight is on schedule, proceed to the airport for your flight. Day 1: 3 Day gorilla tour in Congo : Transfer to Volcanoes National park. Day 2: 3 Day gorilla tour in Congo: Mountain Gorilla Tracking. Day 3: 3 Day gorilla tour in Congo: Transfer to Kigali. In the morning after a relaxed breakfast, you will transfer back to Kigali, with stop over on the way to admire the beautiful topography, and shopping. Have city tour in Kigali where you will visit the local market, museum, genocide memorial center. Dinner and over night at your chosen hotel or transfer to the airport for your departure flight. * Airport transfer, as long as your flight is on the same day on which the safari ends. * Expenses of personal nature such as; drinks, tips, laundry, telephone, cigarettes, accommodation & meals not indicated in the itinerary and optional activities.